Drypoint is basically: scratch image into a metal plate using varying pressures and angles to create different mark thicknesses, ink the plate so the ink catches the burrs created by the needle, soak paper so the plate creates an impression (like a letterpress effect), then roll it through the printing press. Most of the steps I've photographed so you can see what it looks like. 8. 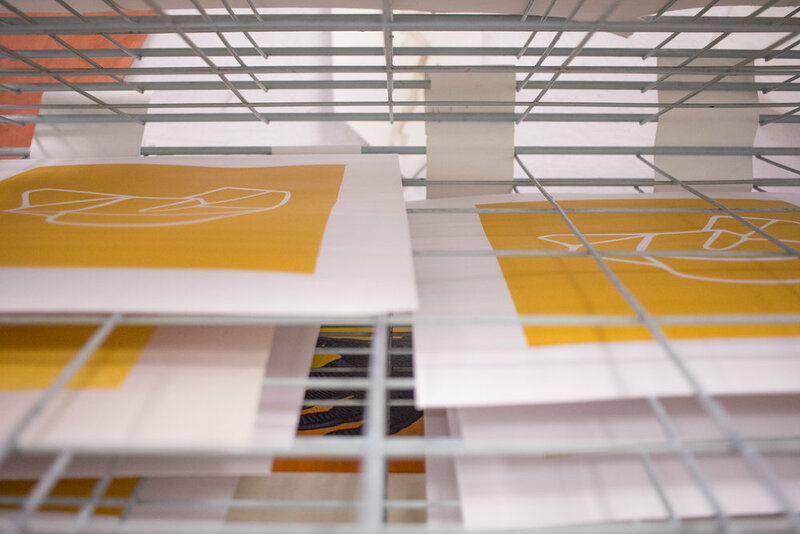 Lift the paper slowly and admire your prints! The last step is stapling the still-damp paper to a board to dry it flat, then cleaning the ink off of (and out of) the copper plate. Leave a comment and let me know which pieces you'd like to see in ya closet! Hey friends. Thanks for clicking this tab! I'm excited to give blogging a second go---my WordPress blog was fine, but the writing was lame (haha) and I like the idea of starting afresh. This is where I'll post travel photos + blurbs/misadventure tales, art tutorials, photo stories, project announcements, and whatever else comes to mind. THANKS for joining in! Even if it's just my grandma reading this rn--hey Grandma--I'm excited to get this going.